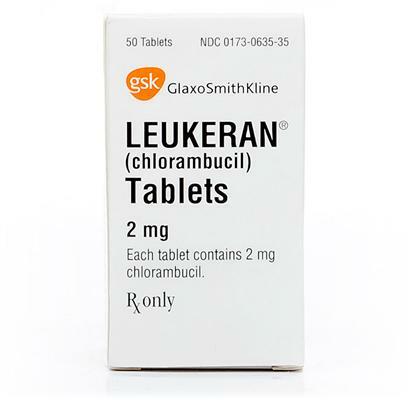 Leukeran is a prescription medication used to treat certain cancers in dogs and cats, such as lymphocytic leukemia, ovarian cancer, multiple myeloma, and lymphoma. It is also used in some immune mediated conditions. While Leukeran is not a cure, it may help to reduce the severity and spreading of these diseases. Please note: Leukeran must be refrigerated and will be shipped overnight automatically. If your pet exhibits bruising, bleeding, infection, difficulty breathing, or low-energy, contact your veterinarian as these symptoms may be due to anemia or a bleeding disorder. Other side effects may include: low white blood cell count, low platelet count, damage to the gastrointestinal tract, bone marrow suppression, damage to the kidneys or liver, blood cell deficiency, lung disease, infertility in males, and hair loss in some breeds. Contact your veterinarian if you notice anything unusual. Talk to your veterinarian and use with caution pregnant or young pets. Not for use in pets with pre-existing bone marrow suppression, already immune suppressed pets, or pets with chronic infections. Tell your veterinarian if your pet has experienced any medical diseases or conditions, digestive upset, or allergic reactions to Chlorambucil or similar products. Tell your veterinarian about any other medications, vitamins, or supplements that your pet is taking. Possible drug interactions include: azathioprine, allopurinol, amphotericin B, colchicine, chloramphenicol, corticosteroids, and cyclophosphamide. Always follow the directions provided by your veterinarian. This medication is administered by mouth. Wear gloves when handling this medication. As a cancer drug, the usual dose is once a day, once every other day, or every 2-3 weeks. As an immunosuppressant, the usual dose is once a day or once every other day.